I probably decided while attending the last QuiltCon that I would submit quilts for the upcoming QuiltCon (in Savannah in February). 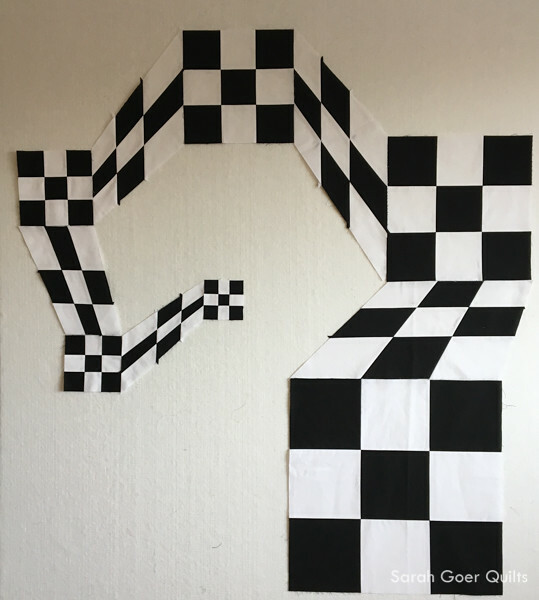 When I saw the Nine-Patch Challenge I knew I wanted to play with the geometry of the 9-patch and turn it into something non-rectangular. I made many sketches before zeroing in on a few possible versions of this idea. I settled on this version knowing that it would be a challenge to piece. I redrew my design in Illustrator as a 60" by 60" quilt. Much later in the process I questioned my choice in size, though in the end I'm quite pleased with the strong visual impact at this size. I decided I preferred a non-square quilt and adjusted the final size to finish at 51" x 61". 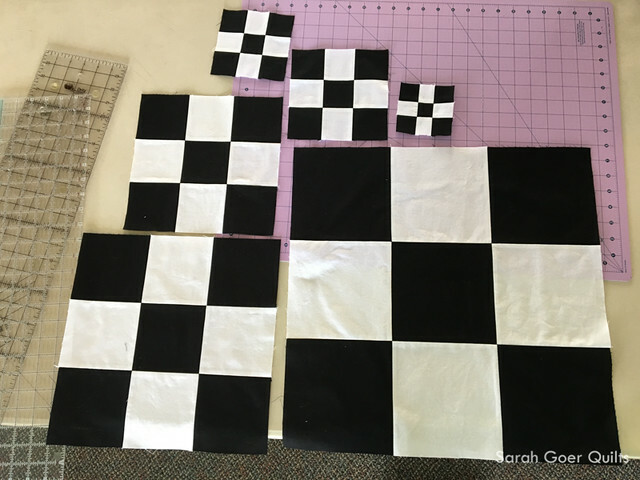 Though the design was completed earlier, the entirety of this quilt was cut, pieced and finished in the month of November. Naturally, I began with the regular 9-patch units, a variety of sizes ranging from 3" to 18" finished blocks. Then I moved on to paper piecing the skewed 9-patch units. Finally, with five days left until the submission deadline, I got to work on piecing the quilt top. I used my Illustrator document for measurements to meticulously cut the right triangles necessary to fill in next to each side of my trapezoidal 9-patch units. From there it was like piecing together a puzzle. This was the step that was going to make or break my project and I was quite pleased when stuff started going together as planned. Four days left. I made my quilt label and chose a backing fabric that didn't require piecing. (Score!) Then I basted my quilt and pondered how I would quilt it. Three days left. I made my final decision for quilting, deciding on large pebbles (I prefer to think of them as river rocks) after a recommendation from Sarah. (Sometimes a crazy suggestion from a friend is just what we need!) This decision was not made lightly, with the submission deadline approaching. I spent 13 hours over two days quilting. Submission day. The deadline was 10pm PST, so I had all day to trim, bind, photograph and submit my quilt. To say I was thankful that nobody in my family came down with any type of illness would be an understatement. A million thanks to my family for letting me check out for four days which enabled me to finish and submit my quilt on time. 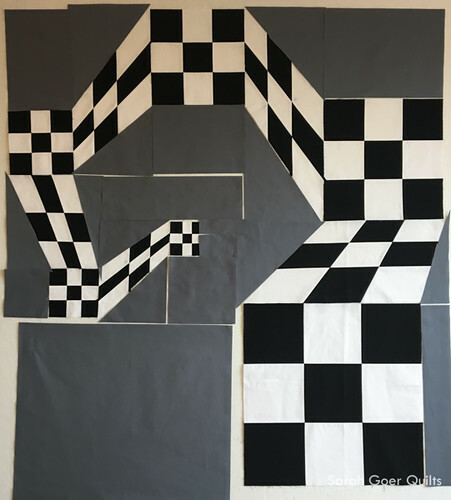 I have really enjoyed seeing some Nine-Patch Challenge quilts pop up on Instagram and I look forward to seeing which quilts are selected to hang in the show. Congratulations to all who entered! Yesterday I received my rejection letters for the two quilts I submitted to Quilt Con. I'm bummed. This is a hard time in our community with people experiencing a whole array of feelings about why their quilts didn't make it. I hear ya. I really do. I'm definitely disappointed. However, it doesn't change the fact that I'm damn proud to have made this quilt. I was inspired by a fairly open-ended set of challenge guidelines and I designed and made a quilt that I love. The construction of the quilt was a stretch for me in multiple ways. For that, I feel like a winner. True, I had visions of my quilt hanging in the show in February and having my photo taken next to it. And I'm disappointed that won't be happening. However, just because this particular quilt wasn't a good fit for this particular show, doesn't mean I'm upset that I made it. Or that I wish I hadn't bothered. Here's my perspective on creating. While I loved attending my first QuiltCon this year and would be proud to have a quilt hang in that show, I am not defined by whether my quilt was accepted or rejected for this, or any, show. I strive to make quilts that I love. The reasons I love them may vary across projects or even change over time, but I make because I love what I'm creating, not because I'm trying to make them fit in someone else's definition of good. And let's talk about good for a minute. There are some things I could have done differently with my quilt. Small ways I could have improved it a bit. (I felt this way before the rejection letter. ;-)) But, my quilt wasn't rejected because it wasn't good. 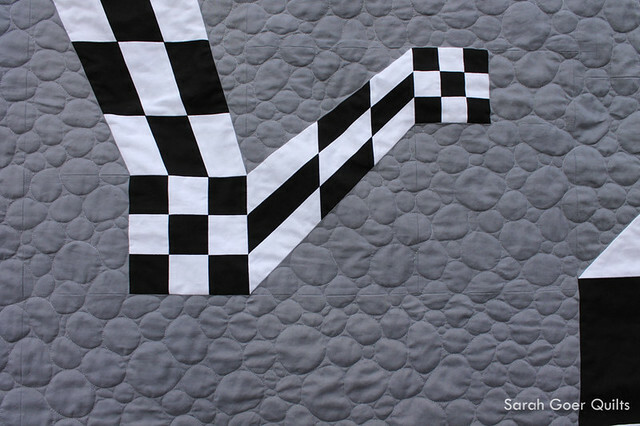 It's darn good and so are the many other rejected quilts. (For the virtual show, see #quiltconreject on Instagram.) There were over 1,500 quilts submitted for this show. And my guess is that over 75% of those were rejected. To cultivate a show, there are many factors that go into the selection process. The rejection isn't personal. 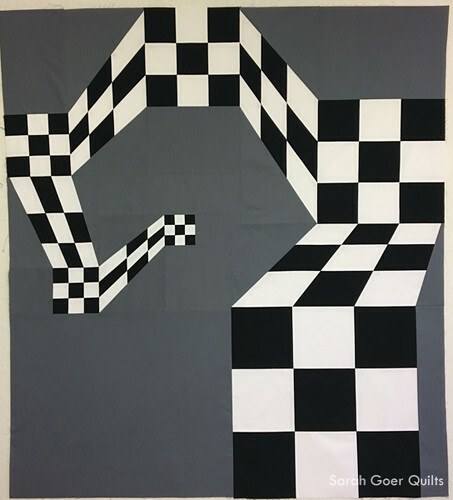 This isn't the result I wanted for my first submission to a juried quilt show, but I look forward to entering this quilt and others into future shows. Thank you to all my friends who were supportive along the way as I worked on this project. I'm linking up to Needle and Thread Thursday and Finish It Up Friday. Posted in Quilting. 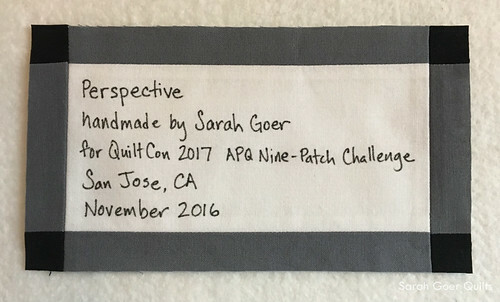 Tags: Nine-Patch Challenge, Perspective, QuiltCon on December 15, 2016 by sarah. Sarah, this is such an awesome quilt. I am blown away by the way you were able to transform your vision into this perspective-bending masterpiece. I think the Modern Quilt Guild missed the mark in not selecting your quilt. 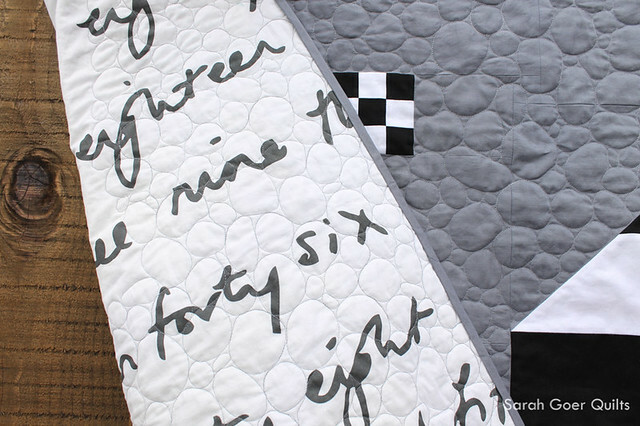 I appreciate all you shared in this post about the quilt itself AND why you create which totally resonates with me. Take care, Mary. Thank you, Mary! I may play with this design in the future. I have some other ideas for it. I love this quilt. Any thoughts on a tutorial for those trapezoid 9 patches? 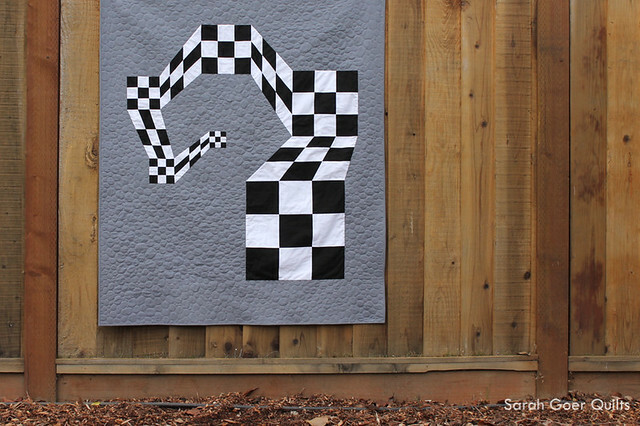 Your perspective on creating a quilt that challenged you is perfect. It is a bummer to get the rejection letter, but it's not going to stop you from creating the next things. I love this quilt! I am so sorry it will not be at the show, I really would have liked to see it in person. 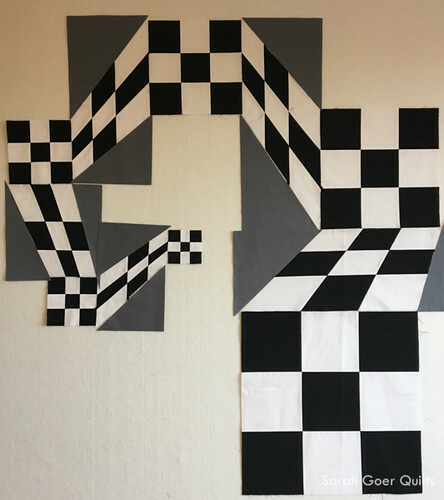 I really like how you used the 9 patches to create such perspective and such an interesting shape. Thank you, Cheryl. I thoroughly enjoyed making it. Looks great Sarah!! And your attitude about whether your quilt hangs in the Quiltcon competition is a good one to have. Keep it positive. Remember, you quilt because you love the many outlets it affords you in the long run.You go kiddo!! That is such a cool quilt! Beautiful job. When we get settled in our new place, maybe I can tackle something like this. Thank you, Johanna. Good luck with getting settled. I hope you're sewing soon! What a stunning quilt. I love it. Sarah, it's a winner in my book! What a creative way to highlight the nine-patch. 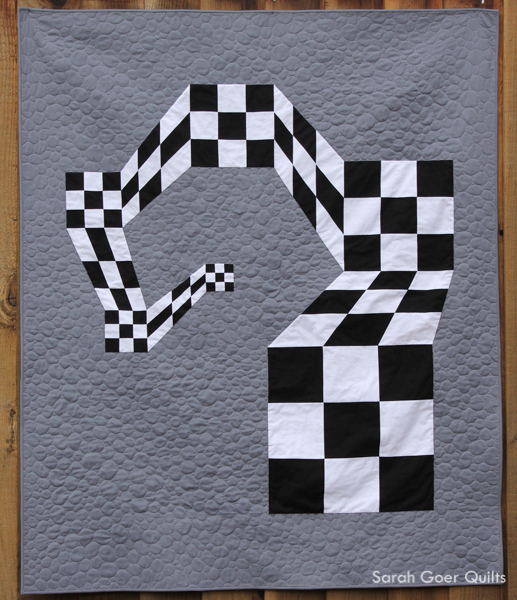 It is such a great design and I love your quilting also! Thank you, Paige. It's been so interesting to see the different takes on the nine-patch challenge. Congratulations on your quilts that are heading to the show!! I really enjoyed watching the progression of your complex design. I happen to know of a fabulous quilt show in early April where this quilt will be a wonderful, modern addition!! And I'm sure it'll get in! ;-) Thank you so much for your support and your kind words. 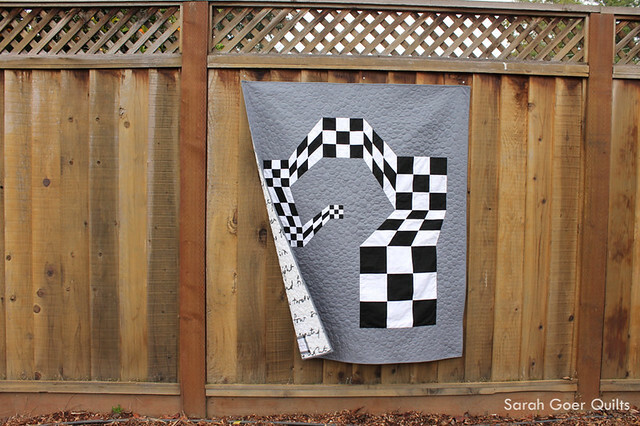 This is a very interesting quilt! Love it! I love how this has a feel of a question hanging in the air, Sarah. The river rocks / pebbles were a beautiful way to quilt it, and I appreciate your perspective on submission.